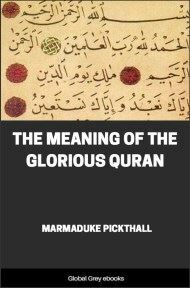 The Meaning Of The Glorious Qur'an is an explanatory translation of the Qur'an by Marmaduke Pickthall. In 1928, Pickthall took a two-year sabbatical to complete his translation, a work that he considered the summit of his achievement. Pickthall noted the impossibility of perfectly translating the Arabic into English, and he titled his work The Meaning of the Glorious Quran. 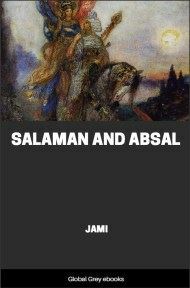 It was the first translation by a Muslim whose native language was English, and remains among the two most popular translations. 2 This is the Scripture whereof there is no doubt, a guidance unto those who ward off (evil). 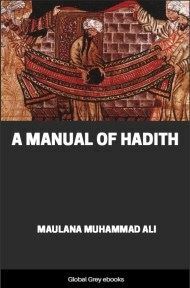 4 And who believe in that which is revealed unto thee (Muhammad) and that which was revealed before thee, and are certain of the Hereafter. 5 These depend on guidance from their Lord. These are the successful. 6 As for the Disbelievers, Whether thou warn them or thou warn them not it is all one for them; they believe not. 7 Allah hath sealed their hearing and their hearts, and on their eyes there is a covering. Theirs will be an awful doom. 8 And of mankind are some who say: We believe in Allah and the Last Day, when they believe not. 9 They think to beguile Allah and those who believe, and they beguile none save themselves; but they perceive not. 10 In their hearts is a disease, and Allah increaseth their disease. A painful doom is theirs because they lie. 11 And when it is said unto them: Make not mischief in the earth, they say: We are peacemakers only. 12 Are not they indeed the mischief-makers? But they perceive not. 13 And when it is said unto them: believe as the people believe, they say: shall we believe as the foolish believe? are not they indeed the foolish? But they know not. 14 And when they fall in with those who believe, they say: We believe; but when they go apart to their devils they declare: Lo! we are with you; verily we did but mock. 15 Allah (Himself) doth mock them, leaving them to wander blindly on in their contumacy. 16 These are they who purchase error at the price of guidance, so their commerce doth not prosper, neither are they guided. 18 Deaf, dumb and blind; and they return not. 19 Or like a rainstorm from the sky, wherein is darkness, thunder and the flash of lightning. 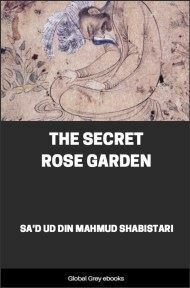 They thrust their fingers in their ears by reason of the thunder-claps, for fear of death, Allah encompasseth the disbelievers (in His guidance, His omniscience and His omnipotence). 20 The lightning almost snatcheth away their sight from them. As often as it flasheth forth for them they walk therein, and when it darkeneth against them they stand still. If Allah willed, He could destroy their hearing and their sight. Lo! Allah is able to do all things. 21 O mankind! worship your Lord, Who hath created you and those before you, so that ye may ward off (evil). 22 Who hath appointed the earth a resting-place for you, and the sky a canopy; and causeth water to pour down from the sky, thereby producing fruits as food for you. And do not set up rivals to Allah when ye know (better). 23 And if ye are in doubt concerning that which We reveal unto Our slave (Muhammad), then produce a surah of the like thereof, and call your witness beside Allah if ye are truthful. 24 And if ye do it not - and ye can never do it - then guard yourselves against the Fire prepared for disbelievers, whose fuel is of men and stones. 25 And give glad tidings (O Muhammad) unto those who believe and do good works; that theirs are Gardens underneath which rivers flow; as often as they are regaled with food of the fruit thereof, they say: this is what was given us aforetime; and it is given to them in resemblance. There for them are pure companions; there for ever they abide. 27 Those who break the covenant of Allah after ratifying it, and sever that which Allah ordered to be joined, and (who) make mischief in the earth: Those are they who are the losers. 28 How disbelieve ye in Allah when ye were dead and He gave life to you! Then He will give you death, then life again, and then unto Him ye will return. 29 He it is Who created for you all that is in the earth. Then turned He to the heaven, and fashioned it as seven heavens. And He is knower of all things. 30 And when thy Lord said unto the angels: Lo! I am about to place a viceroy in the earth, they said: Wilt thou place therein one who will do harm therein and will shed blood, while we, we hymn Thy praise and sanctify Thee? He said: Surely I know that which ye know not.